Okay, so I know I wasn’t going to post this week…but this idea just happened. Hoping it helps you with over-tired, candy-filled, post-4th of July kiddos. My boys LOVE their water guns, but they don’t love to get shot in the face with water. In the past, to give them a productive goal, we’ve set up recycled trash as a target to aim at instead of each other. Laughter over tears is my measure of a successful activity. 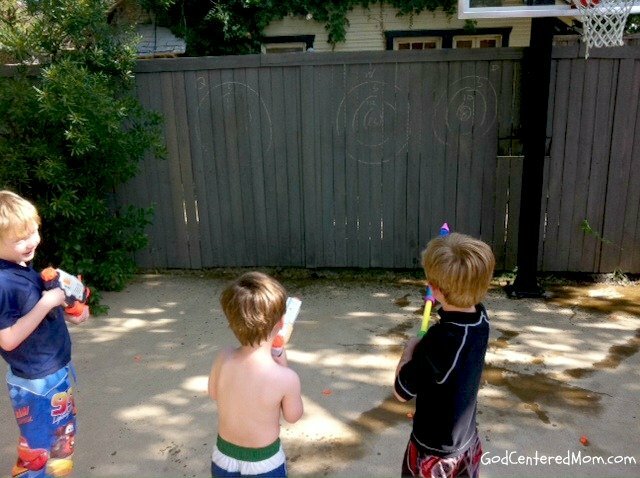 I drew targets with chalk on our fence. One target for each boys (this isn’t my first rodeo…no reason to start an unnecessary fight). My first version had points system (25 for the center, then 15 in the next ring, then 5…). But the boys didn’t seem to notice. Their goal was to “wash” off the chalk from the fence. 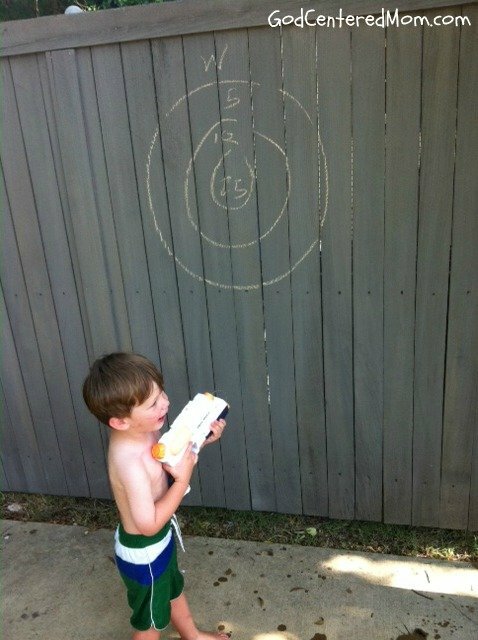 I guess it depends on the age of your kiddos whether they will try to get points by shooting the middle or just enjoy making the chalk disappear. Really doesn’t matter, does it? Once our targets were washed off I started writing their names in chalk to have them spray off. Then they started drawing their own creations to rinse away. Hope your little ones find this activity as much fun as mine did…if not, at least you tried something new. Great idea Heather. Too bad we have a chain link fence! 🙂 We will have to find an acceptable side of the house. that’s a great alternative. Or the garage door. Or even the driveway. will store the idea away in case it ever stops raining in Britain. Currently we’re all flooding. Oh no! sorry to hear that…it’s pretty hot over here. Hope you dry up soon! Fun! 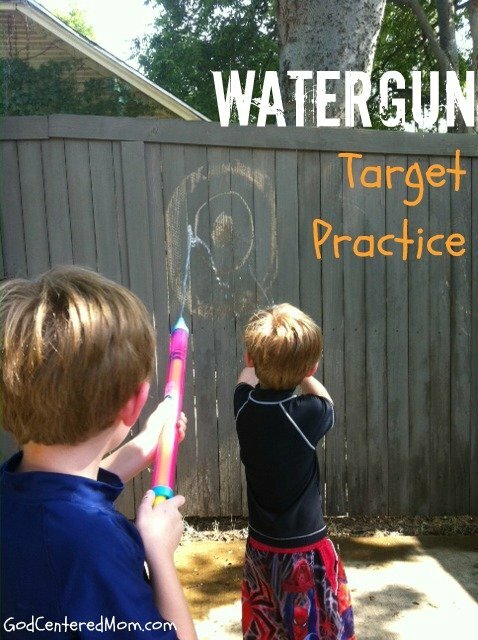 I came up with this similar target practice activity for inside after one too many close calls with a Nerft gun dart to the eye. (Seriously, why do all kids instinctively shoot for the eyes?) It involves Nerf guns, a glass door or window, and window/glass crayons by Crayola or anything else you know you can swip clean off of glass. oh! what a great idea jennifer! We have successfully avoided nerf guns, but I’m confident with 4 boys I don’t have much longer. Good to have a constructive activity with them! Thanks for sharing.